This article is part of a series shining a spotlight on the personalities and priorities of Dal's senior leadership team. Look for more profiles in the weeks to come, and revisit previous profiles at the Leadership and Vision website. Matthew Hebb has a knack for making connections, whether it’s between thoughts, ideas, or people. When considering his early impressions of Dal, his mind goes to three different times and pulls them together. Later, as a teenager, his first job was at Dal, doing data entry – “and other various and sundry activities” — in a Department of Oceanography lab, working for acclaimed oceanography researcher Marlon Lewis. “A lot of his subsequent success no doubt owes some debt to me,” Hebb jokes. Hebb left that job when his family moved to Toronto, where he eventually completed an MA at the University of Toronto in Social Anthropology. But he would find his way back to campus in 2013 to make that third connection: joining the administration as Assistant Vice-President Government Relations & Economic Development. That impression, he says, hasn’t changed. One thing that is changing is that, where once there was a certain reputation for institutional aloofness, today Dal is engaged in so many partnership projects, it is being increasingly recognized for its work towards being a true catalyst for societal and economic development. And Hebb, a connector with many of those partners, has played no small part in that changed perception. One noteworthy example of connecting bright minds to a common purpose to date is Canada’s Ocean Supercluster, a network of ocean-related companies, researchers, and entrepreneurial organizations. The supercluster started in response to a federal funding opportunity in the 2016 budget. Hebb knew there would be competition from larger provinces, but felt a group from Atlantic Canada could be successful. With time and a lot of outreach across the region, the coalition of investors grew, and the vision of the Ocean Supercluster came into sharp relief. 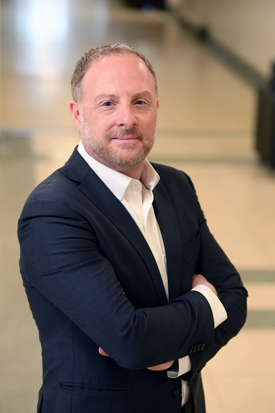 “Even while on vacation in 2017 I was checking my email on a satellite receiver from Great Slave Lake [Northwest Territories], to keep up with the momentum.” The Atlantic group eventually became one of five successful superclusters and Hebb was seconded from Dal to be the founding CEO, to help get the organization up and running. The reason he keeps a close eye on government, and political priorities in general, is that opportunities tend to emerge from unexpected places. He notes that the Ocean Supercluster “didn’t come from a five-year plan.” It was an unexpected opportunity that fit Dal’s priorities. The potential is there. It’s just a matter of creating the right connections. Jazz guitarist Kenny Burrell. Tito Puente is a close second. Don’t let perfection be the enemy of great. And don’t make a decision that you don’t have to. Who is a mentor or leader who has inspired you in your life or career? Richard Florizone was one; I felt very privileged to have been able to work with him. I have always been very inspired by my mother, who, throughout her life, has placed a high value on doing work that has a positive impact in the world. Simone de Beauvoir. I had a weird dream about her that I’ve never forgotten. I think it would be interesting to sit with her, drink wine, smoke cigarettes (I don’t actually smoke) and talk into the wee hours.